Does the Size of the Engagement Ring Matter? Whenever someone thinks of the ideal engagement ring, they usually think of a massive engagement ring with a gigantic glittering center stone so big that you can barely hold up your hand. But who decides how big is too big and how small is too small? Does the size of the engagement ring really matter? We covered this topic on our blog a few months ago. You guys had a lot to say on the matter, but the general consensus was that the size and price of the ring should coincide with the salary of the guy. What do you think? Is bigger really better? 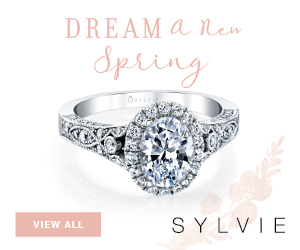 I know this site ALL about the engagement ring, but I could really care less. If my boyfriend proposed I would be happy just for the proposal!! The ring isn’t that important. Well, it depends. If my fiance made a good salary and then bought me a $100 pawn shop ring, I’d be pissed! It should coincide with what they can already afford. Are we talking about the price or the size of the diamond? 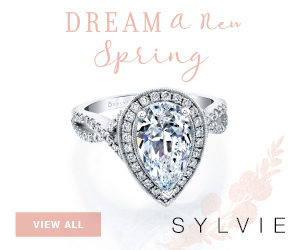 Because the size of the diamond doesn’t matter to me, but it has to be a nice ring and not some pos purchased with a cubic zirconium or something. If he can afford it then yes he better buy it! I don’t know maybe I’m just spoiled but I definitely want a large diamond engagement ring. I mean, if it’s small it wouldn’t ruin the relationship or anything but I would definitely prefer to have a large ring. If he can afford it then yes I want a HUGE rock! Price or size doesnt matter to me, I’d rather my man have a big heart than get a big diamond. I agree with lalakrista…I’d just be happy with the proposal. I don’t think size or price are what matter. I recently got engaged and I have to say… the cut is perfect (Princess, my fave) and it’s a good size. The price was a bit over the top but when I asked my fiance about it he said that the price didn’t matter… he would have paid more if it costed more because when he saw it, he knew it was perfect. I don’t think size or price matter… it’s the thought that counts and the heart behind it! Don’t get greedy because then it looks like you are just out for material things in life (money, social status, “things”). It’s not supposed to be about the material things… it’s supposed to be about love! I don’t think the size nor cost matters. I´m a very simple person who exactly don’t like bring stones that attract a lot of attention. I recently became engaged about two weeks ago and my ring is perfect just for me. I do agree with buying what you can afford and if your mate is unsatisfied with a small ring to me that’s saying she is more concerned with materlisitic items rather than the person she’s marrying. No, it doesn’t… or at least it shouldn’t. When I was originally proposed to, all my guy had was an old simple silver ring, no diamond. Later, he got me a new silver ring with several little diamonds inset into the band. 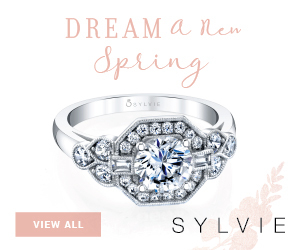 It’s a beautiful ring, and as simple as it looks, I love it! I never even asked how much it was, and I don’t really care. I have to agree with most of you here I would rather have a sweet guy than a huge “rock”. I just recently got engaged and my man is not perfect but hes perfect for me and he does everything he can for me and my kids..
Well first off an engagement ring is something that you will always wear. Something that you’ll never want to take off. I would think that it would be better if it were more conventional, something you can wear everyday, not just on those “special occasions.” Say you had a ring that had little tiny diamonds surrounded by one huge rock, you’d most likely be watching and making sure you didn’t lose a stone. I don’t think the effort of watching over any ring is worth it. I would honestly stop wearing it for that fact. It’s not necessarily what the ring has on it, it’s the symbolic meaning. Knowing that someone looked for a ring and spent the time and effort for something that represents how they feel. Honestly nothing comes close to how a person feels about someone that they are in love with. The ring size isn’t important. The ring will hold meaning no matter what. I agree with the other Vanessa. It depends on what kind of person you are and what kind of personality you have. I found very beautiful rings that are much prettier than those big rocks for way cheaper. They have way more design and are more unique. Why would you want a huge ring just to show off to your friends and look conceited. The truth: Yes I wanTED a nice, good size that won’t get me mugged diamond. The reality: my bf has taken his sweet time to decide when and/or if to propose (6yrs later) that I am on the verge of moving on without him that I this point in time the ring is not even important to me. His commitment to me is the only important thing. (Although it has taken me this long to realize it.. guess good thing he has waited this long). However, I cant be a Lady in waiting forever.. I love him but I love me more.. with ring or no ring. I don’t think the size of the ring should matter, however since size is relative to cost then I think the guy should spend more or at least an equal amount on the ring to what he spends on himself. 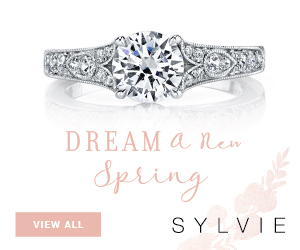 I would never want anyone to spend too much on a ring for me because personally I would rather the money to go to something more useful like a house, etc., but I know that if my boyfriend were to spend $2,000 on a computer and only $500 on a ring it starts to show how much he thinks your worth, and in that case…not very much. I know I found a ring I completely love and it’s only $640-ish. My boyfriend told me that whenever he did plan on buying the budget he had in this mind was around $2200. I told him that I really didn’t need him to spend that much, but to know that he would made me feel good. So, in short, if he spends it on himself he better spend it on you. I dont think the size of the ring or price should matter at all. I don’t understand why you would want to know the price anyway. Whats the point? If my boyfriend loves me enough to propose in the first place, and have enough consdieration to pick a ring out for me by himself. I will love it no matter what because it came from him. The size of the ring DOES matter as much as clarity and colour to me. I go big or go home with everything on my guy. Don’t settle or ull live to regret it. Where can we buy the ring pictured here? 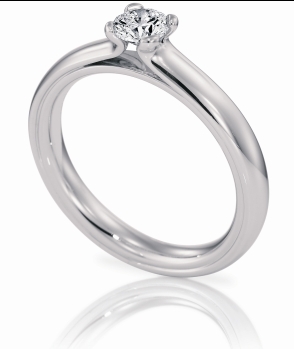 We’ve been searching everywhere for a simple, low-profile ring like this, but they’re almost impossible to find. check out the designer Sholdt that’s part of our network. TBH I think it depends in the woman. I am recently engaged and I actually chose my ring. It’s not big but it is very unique to me. My fiance can definitely afford a much bigger and pricier ring but I’m not a huge fan of big jewelry anyway(except earrings) so it wouldn’t have made sense for me. It honestly depends on the woman wearing it. Know what your woman likes.